Commercial Marine Dredges are used to hydraulically fill Caribbean GeoTextiles' geotextile tubes and bags with the sludge or spoils. 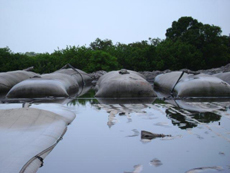 Dewatered sludge using geotextile tubes is a process commonly found in industrial, municipal, agricultural and hazardous waste applications throughout the Caribbean and Bahamas for Hurricane Storm Protection. Because the woven fabric of the geotextile tube is porous, the excess water slowly drains from the tube on its own, effectively and inexpensively dewatering the sludge. When the tubes are injected with certain polymers, the solids then begin to coagulate, forcing the water to release. As the excess water is forced from the sludge, the entire volume is reduces, which allows the tubes to be over and over again. When the tubes have filled to capacity, the tube will continue to dewater. Once dewatered, the tube can be cut open and the dewatered sludge can be transported to a landfill or used to create new land. The use of Caribbean GeoTextiles' eco-friendly GeoTextile Tubes is usually the most cost-effective and practical method of Hurricane Storm Protection dewatering sludge. Since there is no equipment to purchase and the initial cost is low, the cost savings are huge. Past methods required required a large physical area for dewatering. SDMI dba Caribbean GeoTextiles marine products such as tubes and bags are the better choice because they have a small footprint and can be stacked, sometimes requiring just the corner of an available lot. Contact SDMI dba Caribbean GeoTextiles for a free quote at 770-831-8111. We can easily customize the geotextile tubes to fit the size you need for your project. Caribbean GeoTextile' Geotextile tubes and bags are far superior to any competitor product and very cost effective.